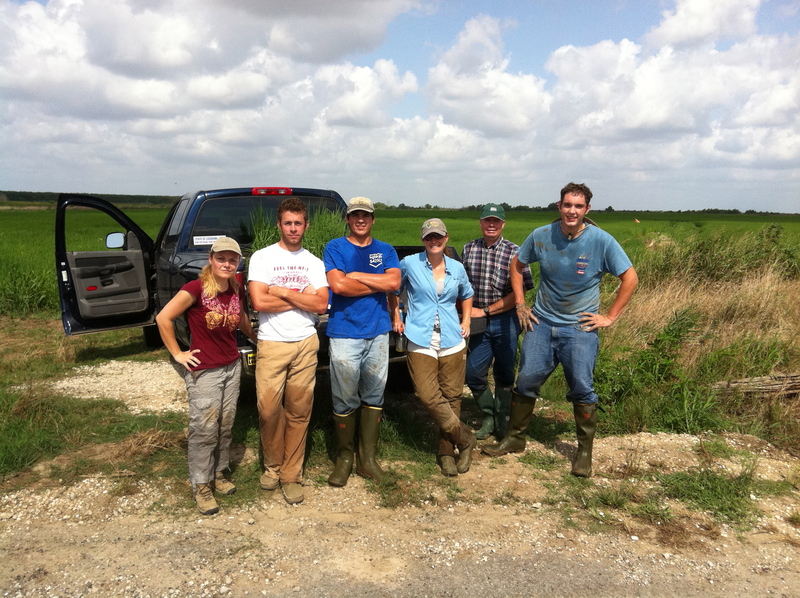 A portion of the rice water weevil field crew. From left to right: Anna Meszaros, Nick Colligan, Jordan Fryoux, Natalie Hummel, Jimmy Meaux and David Albano. Rice water weevil (RWW) management demonstrations have been conducted for the past four field seasons. The purpose of these demonstrations is to evaluate currently recommended insecticides on commercial rice farms in Louisiana to control RWW. These trials are a joint effort between county agents, farmers, consultants, seed dealers and chemical distributors. In 2011, we compared three insecticide seed treatments (CruiserMaxx, Dermacor X-100 and NipsIt INSIDE) to an untreated check. Each treatment was planted in two strips at each location. A total of 6 locations were included in the 2011 demonstration test. The commercial farms were located in Acadia, Calcasieu, Evangeline, Jeff Davis, Rapides and St. Landry parishes. We took stand count data 2 weeks after seedling emergence at five locations and RWW core samples (10 cores / plot) 4 weeks after permanent flood to assess the relative efficacy of treatments at all 6 locations. 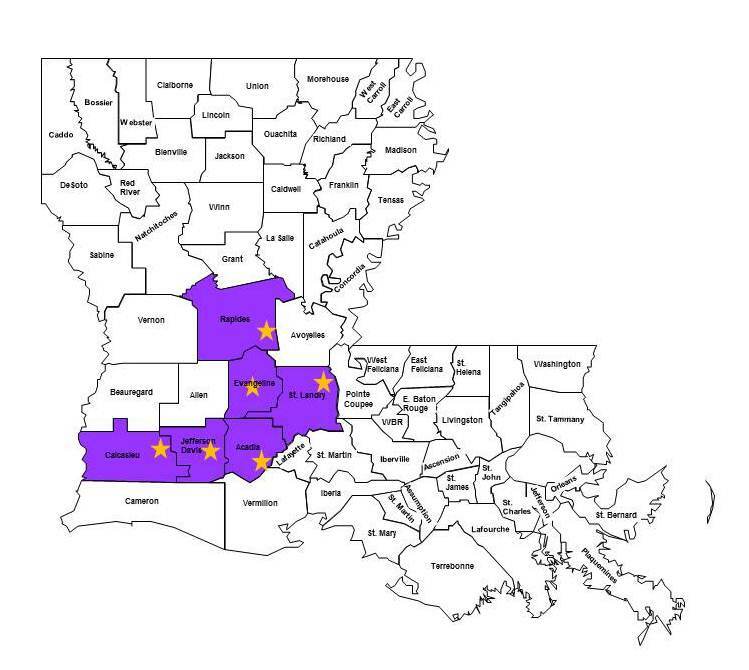 The on-farm demonstrations were conducted in the parishes indicated in purple. At five of the six locations we planted the variety XL745. Thus, the seeding rates were low and the results of our study may not translate to field planted at a higher seeding rate (more than 25 pound seeding rates). We found no significant difference between stand counts. Plant heights were significantly greater in CruiserMaxx and Nipsit INSIDE treatments than in Dermacor X-100. When we analyzed the RWW core sample data we found that all seed treatments had significantly fewer RWW larvae per core than the untreated check (average 12.9 RWW larvae/core). Dermacor X-100 (average of 2.5 rww larvae/core) provided the highest level of control, whereas Nipsit INSIDE (average 7.9 larvae/core) and CruiserMaxx (average 7.9 larvae/core) provided intermediate levels of control. We conclude from these observations that if you are planting rice at low seeding rates (less than #25) and decide to use a neonicotinoid seed treatment (CruiserMaxx or Nipsit INSIDE) you should scout the field at the time of flood for the presence of rice water weevil adults. 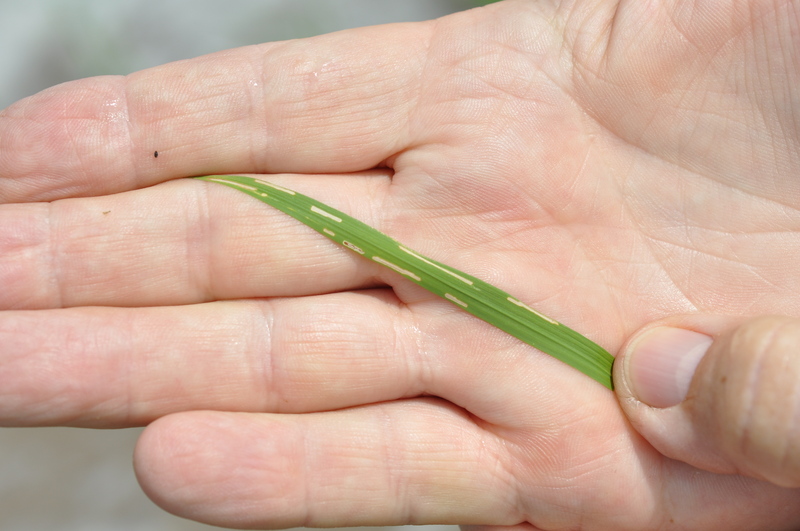 If you find a high population of rice water weevil adults, you may want to consider applying a pyrethroid to provide additional protection from rice water weevils. However, if you use Dermacor X-100, be aware that it does not provide protection against other early season pests such as thrips, aphids, and Colaspis. This project was coordinated by Natalie Hummel, Anna Meszaros and Mike Stout. Thank you to all of our cooperators: LSU AgCenter County Agents: Barrett Courville, Trent Clark, Vince Deshotel, Rob Ferguson, Keith Fontenot, Matt Martin, Jimmy Meaux, Dusty Zaunbrecher; Rice farmers: Chris & Randy Dauzat, Charlie Fontenot, Johnny Hensgens, Kenneth LaHaye, Glen & Wes Simon, Mark Stelly, Bill Wild; Crop Consultants and Company Representatives: Rusty Elston, Dennis Fontenot, Kent Guillory, Rustin Gilder, Cullen Minter, Dean Reed, Randy Verret; our Field Crew: Nick Colligan, David Albano, Jordan Fryoux, Marty Frey and the rice station entomology crew. Finally, we could not have completed this project without the financial support of the Louisiana Rice Research Board, DuPont, Syngenta and Valent. I’ll discuss these results in the rice winter meetings. How did the seed treatments look at your farm? South Farm Tour – results from rice water weevil demo location 1. 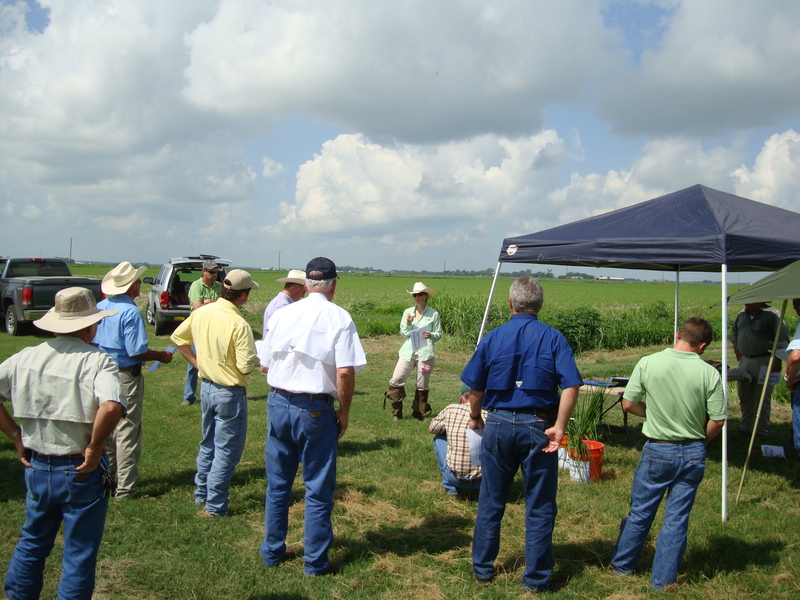 Today we had a nice, but very warm, meeting at the conclusion of the LSU AgCenter Rice Research Station South Farm Tour. 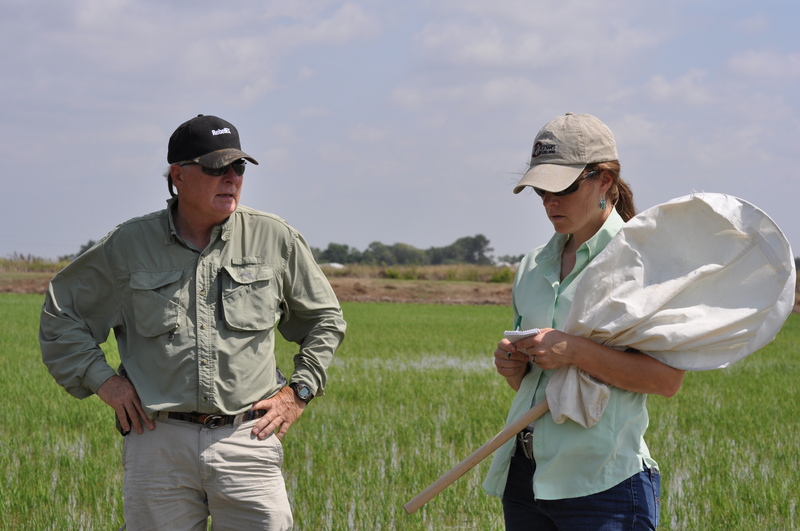 We met at the Hoffpauir farm to discuss the results of the rice water weevil demonstration. The purpose of this demonstration is to evaluate the use of some currently available insecticides to control rice water weevils in rice fields. This location has a very nice layout with multiple cuts of the seed treatments (CruiserMaxx and Dermacor X-100) and also two pyrethroid treated cuts. These treatments were compared to an untreated cut. This location was planted in CL111 at a 65 pounds per acre seeding rate. Rice was drilled in to a water-leveled prepared seedbed. The field was planted in soybeans in the 2009 season. Mr. Darryl Hoffpauir farms these fields and his consultant is Mr. Rustin Gilder (Crowley Grain). County Agent Barrett Courville coordinated the test location. We would like to thank Barrett, Darryl and Rustin for their efforts in this demonstration test. Below is a description of the activities at the field this season. Four weeks after permanent flood we gathered core samples by walking through the field from one corner to the opposite corner in an S-shaped pattern and pulling cores at equally spaced intervals across the field. RWW core data is an average of 10 cores/field. Below is our overall level of control from the different treatments. We had a relatively low weevil population at this site, but all products evaluated provided excellent control. The percent control column indicates relative activity of each insecticide by comparison to the population in the untreated check. This morning I met with County Agent Stuart Gauthier, Rice producer Richard Hardee and Consultant Chuck Greene at the demonstration site in Vermilion Parish just outside of Gueydan. 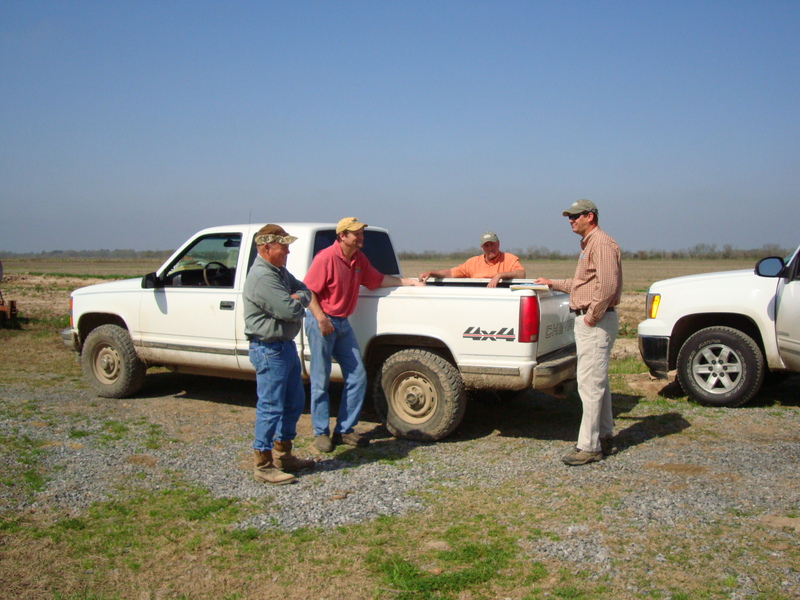 Meeting with cooperators Chuck Greene, Richard Hardee and County Agent Stuart Gauthier near Gueydan, La. This part of the state is really hurting for water – I read the local paper where the headline was the extreme need for water. Some parts of the parish had less than 1/2 inch of rain in April, and other areas had no measurable rain. Compounding the lack of rain is the lack of fresh surface-water available. The parish is still suffering from the effects of salt water intrusion caused by the hurricanes. Fortunately, Richard has access to a well, and we are completing the application of permanent flood on this site. Mr. Greene walked the field with Richard last week to make the decision about a pyrethroid application before permanent flood. Weevil scarring was not abundant in the field and he was hard-pressed to find an adult weevil. The decision was made to wait for a pyrethroid application until after permanent flood. Permanent flood is the trigger for rice water weevil adult oviposition (egg laying). Today we scouted the field that was slated to receive a pyrethroid application – if scouting determined it to be necessary. We were able to find about 10 rww adults, 2 of which were a mating pair. We also found an abundance of fresh feeding scars. 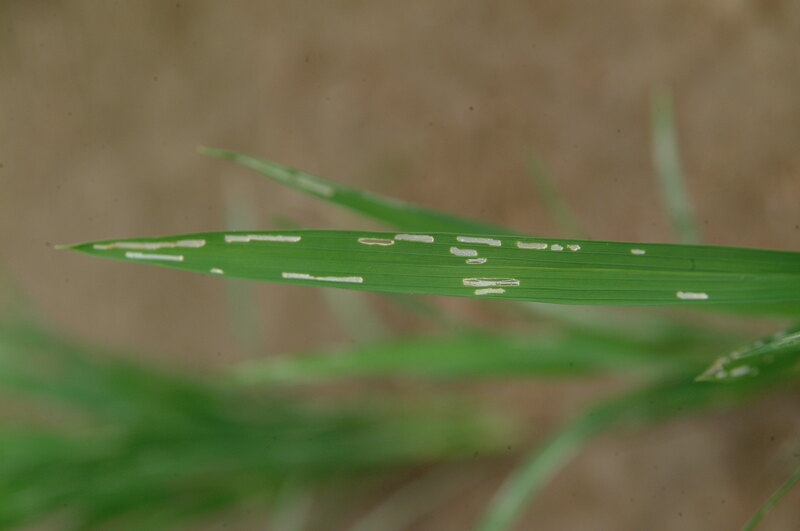 Rice water weevil scars on a rice plant leaf. Stuart also noted that many of the rww adults he found were below the surface of the water – these are probably females laying eggs. Chuck Greene and I discussed our options and decided a weevil treatment was needed. Chuck and I discussed the situation with Richard and decided that a pyrethroid spray is now warranted. We recommended between 1.7 and 2 fl oz per acre of Karate be applied sometime this week when the wind is calm (today was pretty windy). We plan to go back in and scout in one week to make the decision about the need for a second application. This morning I met County Agent Barrett Courville at the Acadia Parish Extension office. Barrett grabbed his rubber boots and we headed out to meet with Mr. Rustin Gilder at the Hoffpauir farm. 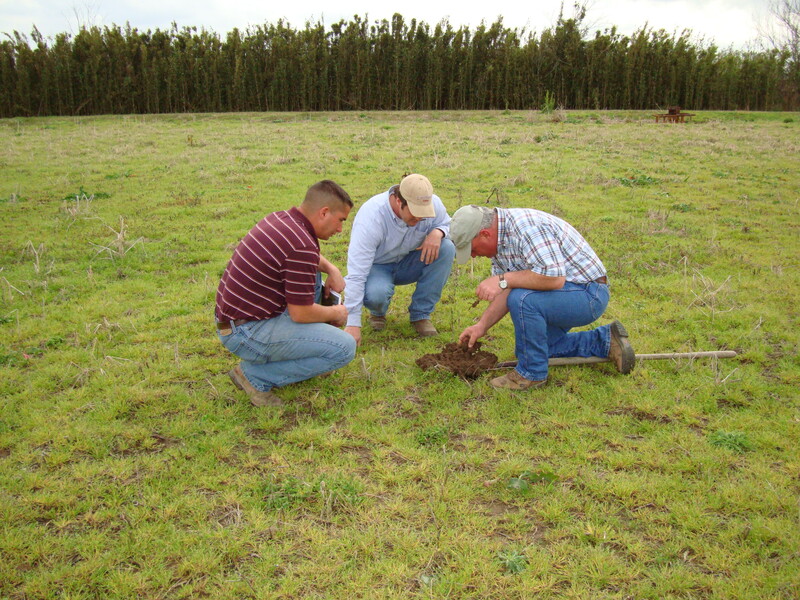 County Agent Barrett Courville and Mr. Rustin Gilder discussing the rww demo at the Hoffpauir farm. The Hoffpauir farm is located in southwest Rayne, LA. The fields we will studying this season, are on the north side of the field road from the fields we evaluated in 2009. This makes a unique opportunity to look at the weevil population over time. This season we will compare CruiserMaxx, Dermacor X-100, pyrethroid to an untreated check. We pulled up some of the field stakes from last season and I saw a nice little black and yellow snake – boy that will wake you up! In Crowley, just south of I-10 we met with (left to right) Mr. Charlie Harmon, Barrett Courville, Jude Bellard, and Doug Leonards. After wrapping up at the Hoffpauir farm, we headed over to meet with Crop Consultant Doug Leonards, and Farmers Charlie Harmon and Jude Ohlenforst. Doug had identified some colaspis damage in a rice field just north of this series of fields that were planted in soybeans in 2009. Doug scouted the bean field for colaspis adults and sent us samples throughout the season. This year, the field will be planted into rice. We decided to have a ten acre section treated with CruiserMaxx within this approximately 80 acre field. If the colaspis cause a reduction in stand, we will be able to compare the untreated seedlings to those grown from CruiserMaxx treated seed. We’ll also be noting date of first emergence, stand count, and plant height. If there is a reduction in stand in the untreated area, we’ll pull cores before flood to see if we find colaspis larvae on the roots. 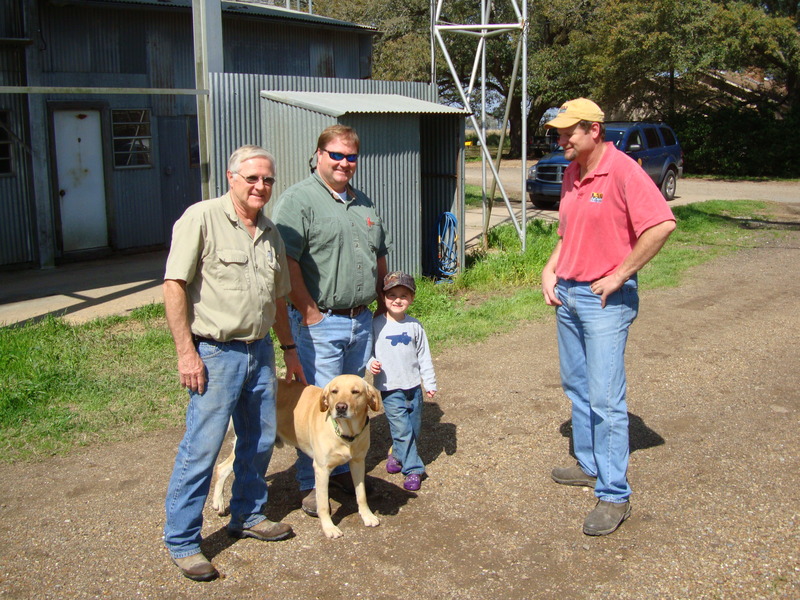 The Lawson family (left to right) Larry, Alan, and Colin with County Agent Barrett Courville in Crowley, LA. Our final stop was to visit with the Lawson family about a test we will be putting out with Michael Fruge (Horizon Ag) and Steven Thevis (G&H). I was delighted to meet three generations of current (and future) farmers. Colin told me that he wants to be a farmer when he grows up, but his dad said that he needs to go to college first. Well, he’s comfortable running around rice fields already. At the Lawson farm, we will be putting out a test comparing CruiserMaxx to Dermacor and an untreated check. Alan is fairly certain that he suffered some stand loss from colaspis larvae damaging roots in a nearby rice field. The field we will work in this year was planted in beans, the stubble was plowed in the fall, then water was held until December when the land was water-leveled. Water was held until late January, so for a period of about 3 months in total. It will be interesting to see if colaspis have survived those conditions. While we were standing in the field Alan walked around and picked up some debri. It is odd to find that in a prepared rice field that is set-back from the road. Alan pointed to a row of Oak trees where the leaves were all removed. The oak trees in the middle of this break that have leaves removed, mark the path of a tornado that destroyed 10 homes, and narrowly passed the Lawson home. The weather was perfect today – this rice field was firm enough to walk on. If the weather holds, a lot of rice will be planted in the next week. 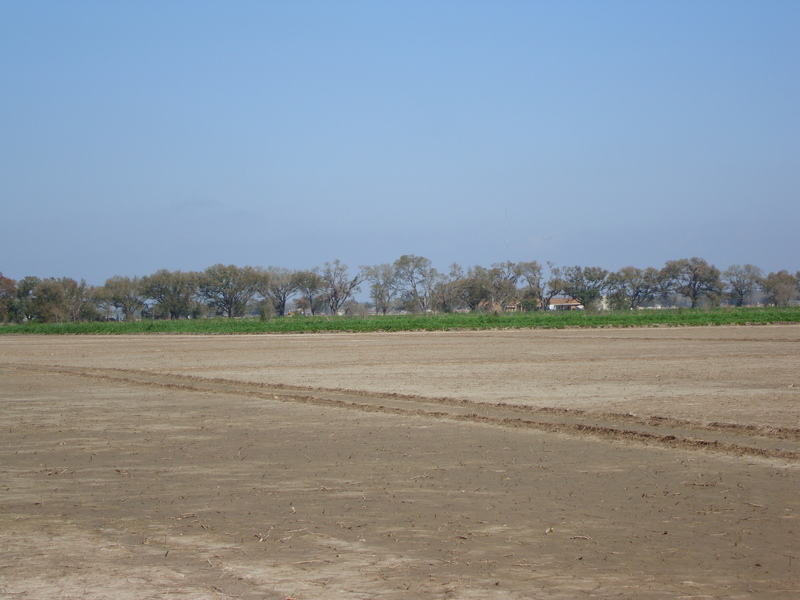 The first rice was water-planted in Jeff-Davis Parish last Friday. Yesterday I visited with cooperators in Evangeline and St. Landry Parishes to discuss this years demonstration sites. Meeting with (from left to right) Kent Guillory, Keith Fontenot and Kenneth LaHaye at the Evangeline Parish AgCenter office. County Agents Keith Fontenot and Vince Deshotel and I met with the Morein family, Mr. Kenneth LaHaye and certified crop advisors, Kent Guillory and Dennis Fontenot. 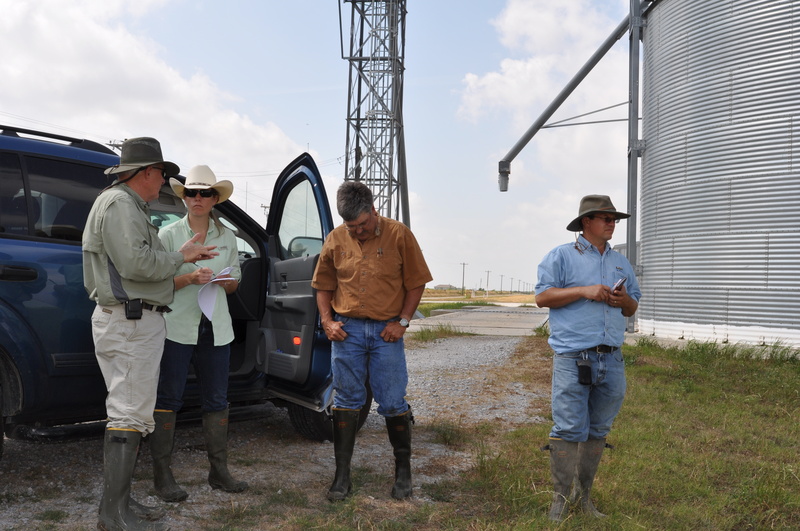 The topic of discussion was plans for the rice water weevil and colaspis demonstration sites. At Kenneth’s farm we will evaluate the following rww treatments: CruiserMaxx, Dermacor X-100, Pyrethroid and an untreated check. The pyrethroid treatment will be a shot of Karate with the last application of newpath before permanent flood. We will come in one week after permanent flood and scout for the presence of adult weevils. If present, we will make a second application of pyrethroid. At the Morein farm we will be looking at colaspis management – if they show up in the field. An adjoining rice field suffered a reduction in plant stand due to colaspis infestation in the 2009 season. We worked with Mr. Dennis Fontenot to sweep the soybeans in a neighboring field. Dennis collected data on colaspis density in the beans and also sent us samples for species identification. This year, rice will be planted into the bean field we sampled for colaspis adults in 2009. We have arranged treatments of CruiserMaxx, Dermacor X-100 and some untreated areas in the rice field. I certainly hope we don’t have problems with colaspis again this season, but if we do, we should be able to learn more about colaspis management. St. Landry Parish Rice Farmer Charlie Fontenot, Consultant Dean Reed and County Agent Vince Deshotel scouting for colaspis in bean stubble. After we finalized our plans for the rww and colaspis demos in Evangeline Parish, Vince and I headed over to St. Landry Parish. I had not realized that St. Landry is such a large Parish. We stopped at a beautiful spot near a Bayou outside of Palmetto, LA that is farmed by Charlie Fontenot. Crop Consultant Dean Reed and Charlie are fairly certain that they suffered about a 10% stand loss from colaspis feeding on rice seedlings in 2009. This resulted in re-planting on high ground in about 200 of the 2,000 acres of rice that Charlie grew last season. We decided to work with Micheal Fruge (Horizon Ag) on a seeding rate evaluation with some clearfield varieties. CruiserMaxx will be used as a the seed treatment at multiple seeding rates. This will give us a chance to evaluate activity at both standard and low seeding rates. We will also compare to Dermacor X-100 and an untreated check. I don’t know if the colaspis will show up in the rice, and hopefully they don’t turn out to be a problem this season. Out of curiosity, we dug around in the soybean stubble at a high elevation on the farm to see if we could find any colaspis grubs. We found an abundance of earthworms and a few other critters in the soil, but no colaspis. It is possible that they are still down low in the soil profile. The soil temperature was 69F, and had very nice tilth. It was nice to give my hands a break from the keyboard for a change. This should be an interesting test location, and if nothing else it sure is beautiful scenery. 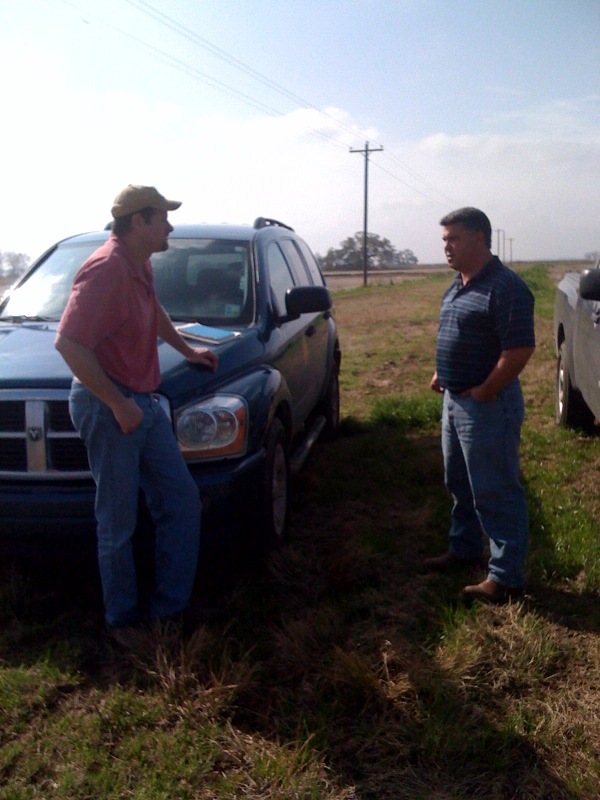 Rice Farmer Alden Horton and County Agent Stuart Gauthier discuss plans for the rice water weevil demonstration test. 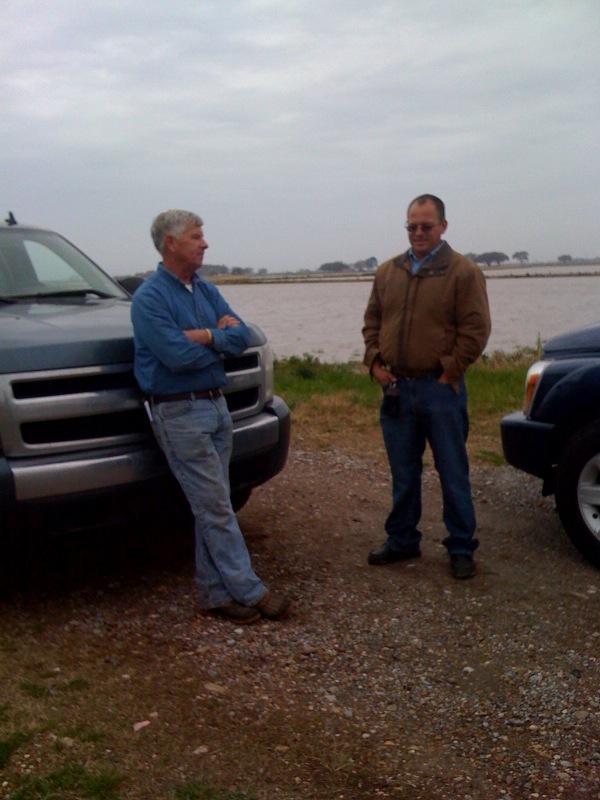 Today I drove to Kaplan, Louisiana (Vermilion Parish) to meet with cooperators for the rice water weevil demonstration. Stuart Gauthier (County Agent) and I met at the G&H store in Kaplan, and then headed out to meet Mr. Alden Horton – rice farmer in Vermilion Parish. 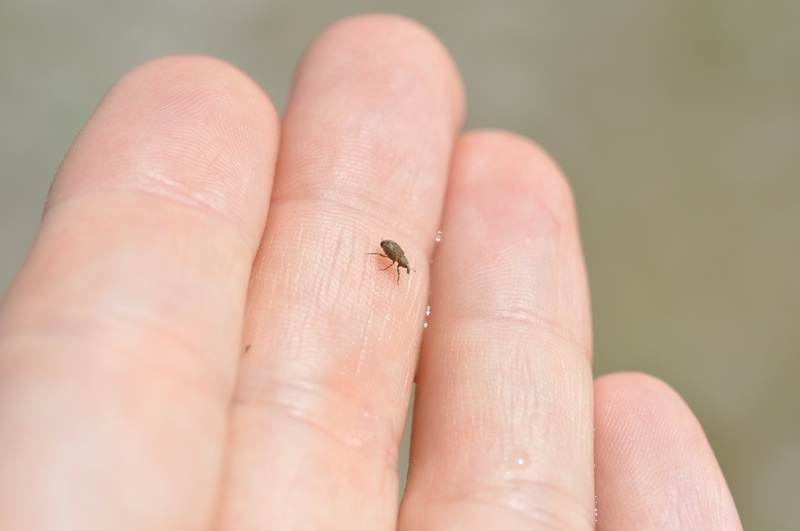 I had mentioned at the winter production meetings that I wanted to look at some water-seeded rice fields to get a feeling for what the weevil populations were like in these situations. Alden volunteered to discuss this with us. This series of cuts is located on Highway 14, not far from Kaplan and Gueydan, LA. I’ll send out a map at a future date. At Alden’s farm we will be comparing an untreated cut to fields that receive a Karate application with the second application on Newpath herbicide. Rice water weevil feeding scars. A second application of Karate will go out if we find rice water weevil adults or fresh feeding scars one week after flood. We will possibly have a meeting at the field when we make the treatment decision. I’ll keep you posted. After meeting with Mr. Horton we headed over to Gueydan to meet with Mr. Richard Hardee. If the weather cooperates, Richard’s rice will be drill-planted, or broadcast and covered. We will be comparing Dermacor X-100, CruiserMaxx, Pyrethroid, Drained, and an untreated check. I’ll be posting the field map soon after the fields are planted. When I stepped out of the truck in Kaplan this afternoon, I was greeted by the familiar smell of boiled crawfish. Maybe spring has finally arrived in southwest Louisiana??? I’ll be visiting cooperators in Evangeline, St. Landry, and Acadia Parish in the next couple of days. I’ll keep you posted on progress as we lay plans for the demonstration work this summer.